Straddling the Albertine Rift and the Congo Basin, Kahuzi-Biega National Park is an exceptional habitat for the protection of the rainforest and the eastern lowland gorillas, Gorilla berengei graueri. 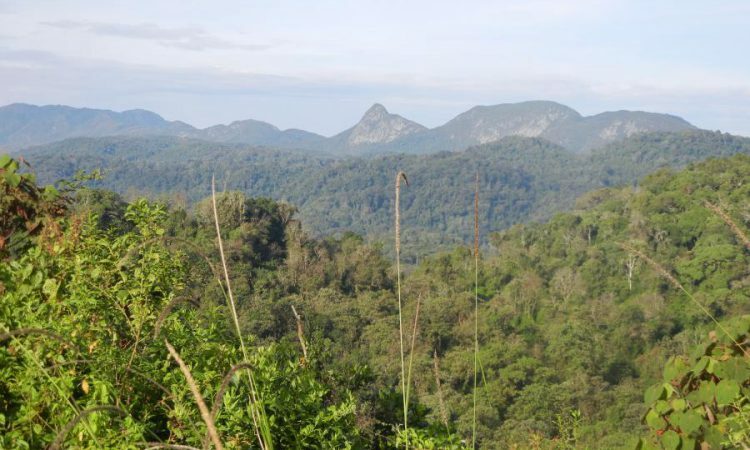 Extending over 600,000 ha, are dense lowland rainforests as well as Afro-montane forests, with bamboo forests and some small areas of sub-alpine prairies and heather on Mounts Kahuzi (3,308 m) and Biega (2,790 m). The Park contains a flora and fauna of exceptional diversity, making it one of the most important sites in the Rift Albertine Valley, it is also one of the ecologically richest regions of Africa and worldwide. In particular, the most important world population of eastern lowland gorillas (or de Grauer), sub-species endemic to the Democratic Republic of the Congo (DRC) and listed under the endangered category on the IUCN Red Data Book, uses the mosaic of habitats found in the property. Kahuzi-Biega National Park contains a greater diversity of mammal species than any other site in the Albertine Rift. It is the second most important site of the region for both endemic species and in terms of specific diversity. The Park protects 136 species of mammals, among which the star is the eastern lowland gorilla and thirteen other primates, including threatened species such as the chimpanzee, the colubus bai and cercopiuthic of Hoest and Hamlyn. Other extremely rare species of the eastern forests of the DRC are also found, such as the giant forest genet (Genetta victoriae) and the aquatic genet (Genetta piscivora). Characteristic mammals of the central African forests also live in the Park, such as the bush elephant, bush buffalo, hylochere and bongo. The property is located in an important endemism zone (Endemic Bird Area) for birds identified by Birdlife International. The Wildlife Conservation Society established a complete list of birds in the Park in 2003 with 349 species, including 42 endemic. Also, the Park was designated as a centre of diversity for plants by IUCN and WWF in 1994, with at least 1,178 inventoried species in the highland zone, although the lowland yet remains to be recorded. The Park is one of the rare sites of sub-Saharan Africa where the floral and fauna transition from low to highlands is observable. In effect, it includes all the stages of forest vegetation from 600 m to more than 2,600 m, dense low and middle altitude rainforests to sub-mountain to mountain and bamboo forests. Above 2,600 m at the summit of Mounts Kahuzi and Biega, a sub-alpine vegetation has developed, with heather, and home to the endemic plant Senecio kahuzicus. The Park also contains plant formations, rare worldwide, such as the swamp and bog altitudes and the marshland and riparian forests on hydromorphic ground at all altitudes. The forests of the property are characterized by continuous vegetation from the summit of the mountains to the lowland regions. A corridor connects a highland zone of 60,000 ha to a lowland sector of 540,000 ha. The area of the property is considered as sufficient to maintain its fauna. Maintenance of the sustainability of the vegetation is essential to avoid the fragmentation of animal populations, in particular the large mammals. Although the greater part of the property is inhabited, some villages were included in the Park at the time of its extension in 1975, creating disputes with the populations. These problems must be resolved to strengthen the effectiveness of conservation actions.